ProfessorVC: It might not be a bubble but sure as hell the rent is too damn high! It might not be a bubble but sure as hell the rent is too damn high! 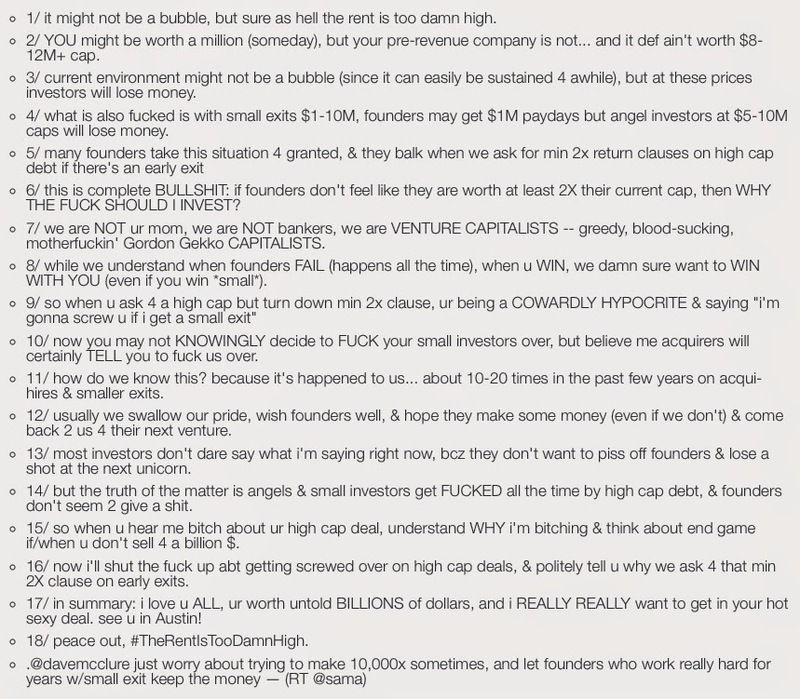 The above was the opening salvo of a controversial tweetstorm yesterday by my former student and 500 Startups founding partner, Dave McClure (full venom below). I invested in my first AngelList syndicate about 9 months ago in the authentication startup, Authy. I started using Authy for two-factor authentication to provide greater security in my digital currency trading. It was a great product addressing a large market opportunity and was interested in seeing how the AngelList syndicate process worked. Suffice it to say when I saw the announcement that Authy was being acquired by Twilio less than a year after making the investment, I was initially excited. As with all M&A exits, there was a round of congratulatory messages to the founder in the Silicon Valley echo chamber. However, when I read the announcement and saw that the acquisition price wasn't disclosed, alarm bells started going off in my head. This is often a sign of an acquihire or very small exit. Also, a private company buying another private company is not a scenario I typically like, although Twilio certainly has excellent prospects and may go public this year, providing liquidity in the medium term. I already own stock in Twilio indirectly through a limited partnership interest in a venture fund and don't need to bet more on Twilio. I don't know the reasons for selling, but presumably Authy felt their prospects weren't promising as a standalone entity and may have had difficulty raising further financing. Due to confidentiality provisions, I can't disclose details, but there are many very unhappy participants who invested through the syndicate. As a refresher, syndicates were introduced by Angellist a couple of years ago as a way for companies to raise funds in small increments from a large number of investors (SEC limit of 99 accredited investors). Subsequently, they also introduced a platform for individual angel investors and funds to syndicate a piece of their investment in exchange for a carry on the syndicated portion. Syndicates can either be company led or investor led. In the case of Authy, it was company led, so the only fees and carry were to AngelList. Conceptually, the syndication process provides a way for companies to effectively conduct crowdfunding and angels to act as VCs. While I find the theory of syndicates appealing, particularly for individuals that wouldn't have access to deal flow on their own, I'm generally not interested in paying additional fees and carry when I can invest directly on my own. If I'm going to pay a fee and carry, would prefer to invest in a venture capital fund, as the investments are being managed by professionals and have a duty to look out for LP interests. However, I did want to check out the process to see if I might want to create my own syndicate. It was indeed very easy to review the investment opportunity and fund through a complete online process. Rather than owning a direct stake in Authy, I became a member of a single purpose LLC created by AngelList to invest in the offering. The entity invested in the same capped convertible note as other investors. AngelList's policy is to have the entity vote along with the majority of investors in the company (not the syndicate) when a shareholder (or in this case, debt holder) vote is required. Once the specifics of the transaction were posted to the members of the AngelList syndicate, there was a heated discussion regarding how the transaction was valued in relation to the valuation cap. The board decided not to use an external valuation of Twilio's common stock that had been done the month prior to the acquisition, but instead come up with their own valuation methodology. Of course, this was favorable to holders of common stock (the founder being the largest shareholder) and in addition, the founder received additional benefits in the transaction, presumably at the expense of the debt holders. Interesting thing about all of this is that one of the primary reasons Naval Ravikant started AngelList was to improve transparency in the investment process (along with access to deal flow). Transparency became a huge issue for Naval after he felt he was screwed by VC investors prior to his startup (DealTime) being acquired by Epinions. In fact, he took the extra step and filed litigation against two Sand Hill Road firms, something that is rarely done When syndicates were announced in 2013, I had a twitter exchange with Naval regarding the transparency issue in regards to the syndicate lead's investment. Given the above, it is interesting that AngelList has been trying to avoid full transparency on the transaction. I have heard from many investors who think they got a raw deal. A number of the posts relate to how the Authy board determined the fair market value of the deal consideration, particularly in light of the board being controlled by the founder. One of the investors in the syndicate says some of his critical posts have been deleted and he has been bullied by someone on the AngelList team. While it may not be practical from a process or legal standpoint to have the individuals in the syndicate vote on corporate matters, they should be treated with complete transparency on the transactions rather than trying to decipher the hocus pocus on a deal. 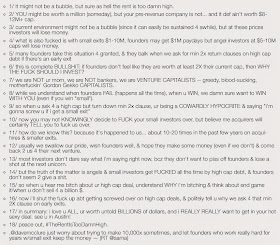 My intention of the post isn't to bash AngelList. I have been a big fan of AngelList from day one and am definitely entrepreneur friendly. In fact, I have been on the platform since it's early days as a daily email sharing interesting angel opportunities. It has definitely grown up and become a major force in the entrepreneurial ecosystem. However, I will think long and hard before joining another syndicate. Exactly!! Of course, that is not any different from the losses most angel investors suffer. You need a diversified portfolio of at least 25 investments to expect good returns and if you are paying fees and carry, will impact those returns. Also an update: AngelList is scheduling a call with the investor group (3 weeks after the fact) to address investor concerns with the deal.